I wrote about Scotch broth here five years ago, and I mentioned that the best soup I’ve ever had was a Scotch broth. It was in Edinburgh, on my first trip to Scotland in the mid-1980s. Though it was a vegetable soup, I might not have known at the time that the stock was based on sheep bones. With Scotch broth, the broth is everything. It’s the sheep bones, I’m sure, that give authentic Scotch broth its sturdy substance. I’ve never made broth with sheep bones, so I’m always looking for substitutes. It occurred to me that the cooking water from chickpeas might help. I’ve never tried it, but I’ve read that if the cooking water from chickpeas is concentrated enough, it will whip up like egg whites. For this pot of broth, I used about one-quarter chickpea broth, one-quarter pumpkin juice (drained from a baked pumpkin that went into a pie), and one-half water. The barley, which is essential to Scotch broth, also helps with thickening the broth. I’ve been known to make a slightly reddened Scotch broth with a touch of tomato paste. 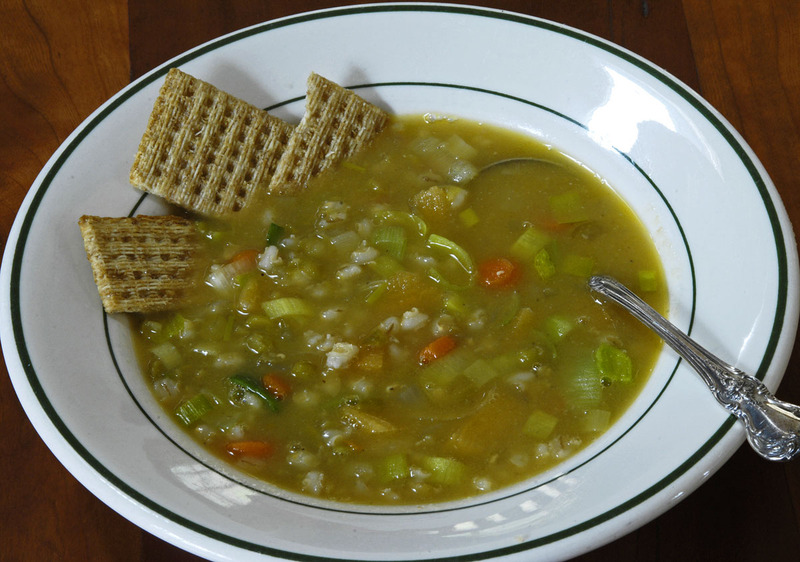 But the Scotch broth that I had in Edinburgh was green — from split peas and leeks, I’m sure. I went for green on this pot of Scotch broth, and I got the color I wanted. The ingredients are the stock, barley, dried split peas, some rutabaga (which I believe the Scottish call a swede), onion, carrot, celery, and leeks. The soup needs a long, slow simmer. I added the leeks for the last 20 minutes of cooking. This was written by daltoni. Posted on Tuesday, January 29, 2019, at 2:57 pm. Filed under Food. Bookmark the permalink. Follow comments here with the RSS feed. Trackbacks are closed, but you can post a comment. Perfect food for this chilly weather. Your ingredients for the broth are interesting. Neither chickpeas nor pumpkin would overpower the other ingredients. Cooking low and slow enhances the flavor of all ingredients. Enjoy the pictures you include very much.